Two years ago I took my oldest daughter to Introduce a Girl to Engineering Day at Ohio State. I shadowed Marissa as she learned about chemical and civil engineering by making bath soaps, ice cream and attempting to build a structure out of 3″x5″ index cards that would hold a stack of bricks six inches above a flat table surface. Back then, I was with another engineering dad and we watched helplessly from the sidelines as our daughters team built something that, as we found out later, couldn’t hold a single brick. Both my daughter and her friend had a good time, but they complained on the way home about a bossy teammate who wanted to control a design that turned out to be inferior. I to this year’s event today with both Marissa and Katie. They made homemade chalk, stretched bubble gum, and assembled a doorbell buzzer. 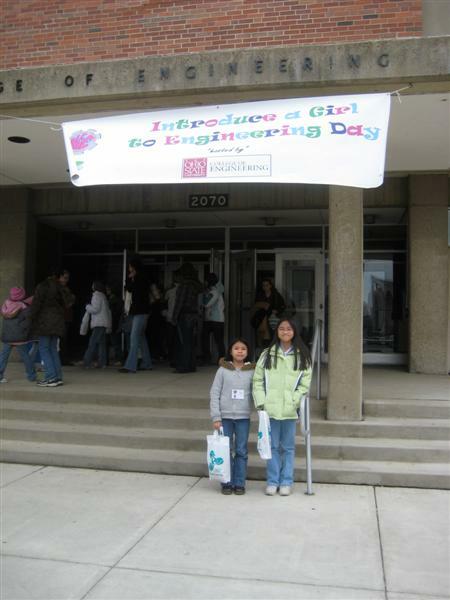 This year, however, they wouldn’t allow the parents to follow their daughters around so I wasn’t able to get any good pictures of them being engineeringesque. The adults were sequestered in the lecture hall for a few, less compelling talks. There was however a team exercise in the middle of the day for the parents which just happened to be the same brick levitating task given my third grader two years ago. Each team had to keep track of the number of 3″x5″ cards they used, the number of cards that had to be bent or folded, and the number of staples what were used. These numbers went into a formula for the “cost” of the design. The goal was to see who could achieve the highest ratio of bricks held to the overall cost. Knowing what designs did work two years ago, I felt I had insider information. I become the leader that I’m sure my teammates found annoying. :-) Unfortunately the other teams of adults knew about cylindrical shapes too. While I’m sure we would have humiliated teams comprised of 8-year-olds, we ended up in the middle of the pack of the adult competitors. 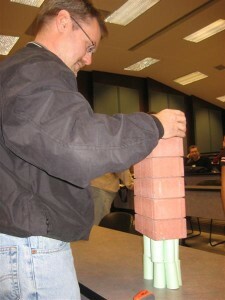 Our design wasn’t too expensive and it held a respectable 6 bricks, but it wasn’t enough. The guy you see in the background on the right was from the team that won. Their design only held one brick more than ours could, but theirs was constructed with half the cards and without any staples! Since the cost of their design was about one third of ours, we would have had to hold twenty bricks to have beaten them. Takeaway lesson: never ask a software engineer to do hardware.